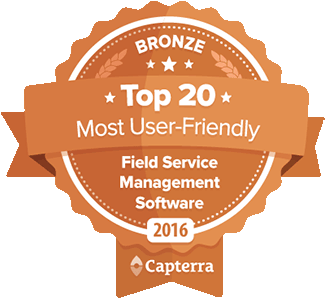 Bella FSM is pleased to announce it was listed in the “Top 20 Most User Friendly Field Service Management Software” 2016 report by Capterra. On average, a technician working for a field service company completes four to five jobs per day. While performing routine maintenance might be a piece of cake for your techs, processing a work order from start to finish can involve a lot of planning. Something as simple as assigning one of your guys to a job can include a lot of questions. Figuring out priorities, availability of your staff, and travel times alone can be a giant headache. And that’s not even considering the billing process for a client when a job is finished. This research is part of Capterra’s series of Top 20 reports. All reports in this new, user friendly series are determined by considering three different ratings criteria: usability, customer service, and customer reviews. Usability is determined through direct user testing, measuring how many seconds and clicks it takes to complete common tasks in a field service solution. We’ve listed these common tasks below. We tried to choose tasks that were representative of the many processes that go on behind the scenes at a field service company. Capterra tested all FSM Service Software solutions made available to them and performed each task two times in a solution. The first time, we completed the task without accessing any training, and the second time, we followed training materials provided by the software company.